This resort is may not the top choice of the ultimate tropical beach in Cebu but they offer a very affordable entrance fee for swimming. The resort is wide and big and also has many cottages. There is also a scuba diving shop inside the resort. So, to those people who want to experience scuba diving and jet skiing try Hadsan Cove Beach Resort! Very over priced. 2000 for cottage day use. you could rent an aircon room with hot shower, TV and WiFi for that price in most of the resort in Mactan. 500 for beach mat !!! The beach is so dirty, boats are going in and out all the time, you have to be careful or else you might lose a head or leg. No lifeguard, If you compline to the management, they say 'swim on your own risk'. Toilets are so filthy. there is no shower. Great Day! I'd like to inquire as to whether Hadsan offers a wedding package?Thanks.. God Bless. how much is your entrance fee per head and cottages? yes we had a lovely family day out and the resort was nice ! MR Leonard smith , from the UK . so your entrance fee per person is 150 php? if we rent a cottage how much would it be? is there a free entrance if we get a cottage? approximately we are 30 +. we are planning to have an overnight swimming in your resort this coming jan. 2... hope that we can hear you answer as soon as possible so we can have a reservation. Is there new photos taken? is there a new photos taken? please..
hi i just want to ask how much the cheapest cottage for 4 person and the entrance for daytime only. The entrance fee may be cheap compared to other beach resorts but the moment when you enter the resort you will experience the worst accommodation, a very expensive and not very attractive cottage at 700 pesos that had not been renovated where even workers who look like "stand-bys" sleeps in them. Be very careful when you expose your food, large flies will greet you before you start enjoying your meal. The beach is very dirty and you can still see left-overs of previous beach visitors not being cleaned by the owner. The owner does not allow you to bring your own table and even bring an extra tent because of a rule that you need to use their rotten cottage and table worth 700 pesos. The beach resort is being used as a docking port for Island hopping activities for Koreans. I DO NOT RECOMMEND THIS BEACH RESORT FOR RELAXATION OR ANY BEACH OUTING VENUE. How much is the overnight stay rate? We are three and we are arriving in Dec. 10. How far is this resort from Dive Scotty? hi, how much is the cheapest cottage good for 6 persons? Bluefins Resort has very nice and newly renovated beach view rooms for 45,000 pesos monthly for the low season. You might need to negotiate the price with them for the peak season. how much to stay 30 days. Im planning on staying at Hadsons Beach resort for 30 days,does anyone know what that would cost and would there be a discount ? Hi. Is there a limitation of people inside a cottage? Is there a charge if we bring food inside? Can you please give the latest information? Thank you so much.! Instead of paying for a cottage or a table, can we just put our picnic mat on the beach and enjoy the beach? Or do we have to pay for the area we put the mat on? I want to ask if theres a corkage? We're planning to spend our get together at Hadsan Beach and bring our own food and drinks. We are 100 to 150 persons. Can we make an early reservation? It will be on dec.18,2011 our get together. Is it ok if we will be there from 9am till 7/8:00pm? the new telephone # of hadsan cove resort is 495-2056,if you want some cottage reservation just call this number or you can also make a reservation @ hadsan fuente office you may call @ 254-0569 or 412-5401. The rates are:entrance-Php40.00 per head only infants is free,cottage-Php700.00,shower-Php50.00,swimming pool-Php150.00,table-Php600.00 & electricity-Php500.00. standard rooms rates are about 2400 pesos (Hadsan office) and 3750 pesos (Blue Fins Resort) per night. any updates for the room rates here in hadsan???? ... pls help me.. i need a room to live for 1 night only..
Do you have latest picture of the place? Where can I check prices and other features? The new telephone number of Hadsan Cove Resort, Inc. is 495-2056. Hadsan Beach is getting more and more developed. The picture is taken from our Italian restaurant "la Scala di Cebu". 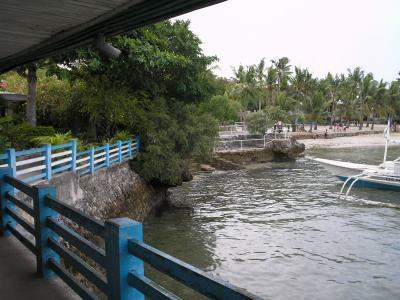 We are one of the most beautiful and romantic beach side restaurants in Cebu, located directly inside Hadsan Beach on a nice rock on the ocean and facing Olango Island. The air is very clean and fresh, the view is fantastic, food is authentic Italian and made mainly of real Italian ingredients, the service is very good and friendly and the prices are affordable. We put emphasis on cleanliness, healthy and high class food, affordable prices, excellent service and a cozy and nice place for our guests to dine and enjoy. There is a new hotel inside Hadsan Beach as well with very clean and affordable rooms. "Blue fin resort". The view is fantastic and the prices are 2-3 times less than in the big hotels. The entrance fee for Hadsan Beach is 40 pesos for the beach usage. If you don't use the beach and go directly to the restaurant or hotel you don't pay this fee. The phone number of la Scala is +63 32 511 7055. Our facebook is: la scala di cebu. Please add us.